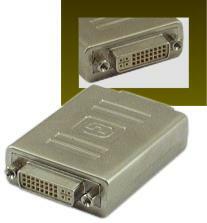 A set of extending adapters for the DVI Interface to facilitate the transfer of high definition digital data over high quality DVI-D cables. The ADP5131 for Single Link DVI-D can be used in combination of existing cables to achieve cable extensions beyond 30 meters. Click Here to see DVI cables that will work with this item.